Have you ever had the one wall in your house that you just stare at? It’s an empty, big space waiting to be filled, but nothing you hang there seems quite right. We had a space like this at our house. I had a little, two-door cabinet that fit perfectly on the lower half of that wall, but the space above the wall was tall, off-white and empty. I would look through décor magazines and Pinterest for hours searching for an idea, but nothing seemed to fit, and I already had one too many black picture frames in our house to begin with. Then when I was visiting my hometown in St. Louis, Missouri over Thanksgiving, in November 2014, I went to a consignment shop with my Mom. In one of the booths someone was selling handmade, wooden signs that had been stenciled with words. Each sign was to be a piece of wall art that would hang by a thick rope. Shortly after my Thanksgiving trip home, I measured our wall. 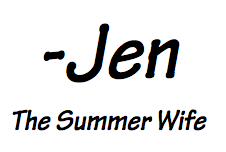 I was planning to re-create the idea I had previously seen in a BIG way that fit my style and our space. I asked my Dad to help with the construction and a few weeks later I received 4 huge pieces of wood nailed together for Christmas. What a great gift for the DIY-er! (Thanks, Dad! – You should have seen him driving this down to Texas in his car). On the front I used white CeCe Caldwell chalk paint to give the background a shabby-chic look. I left this white-ish coat pretty thin because I wanted the wood’s texture to show through. 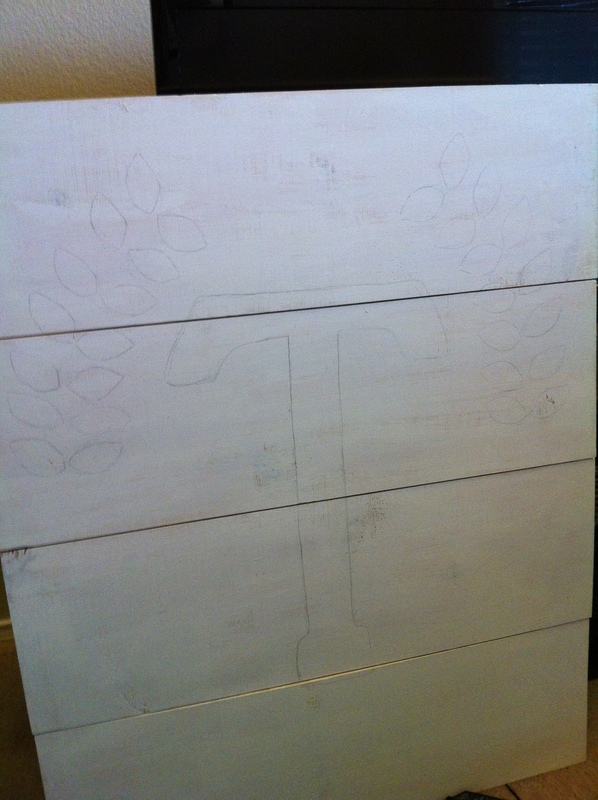 I stenciled our last name initial “T” in the middle and drew the wreath leaves by hand before painting. 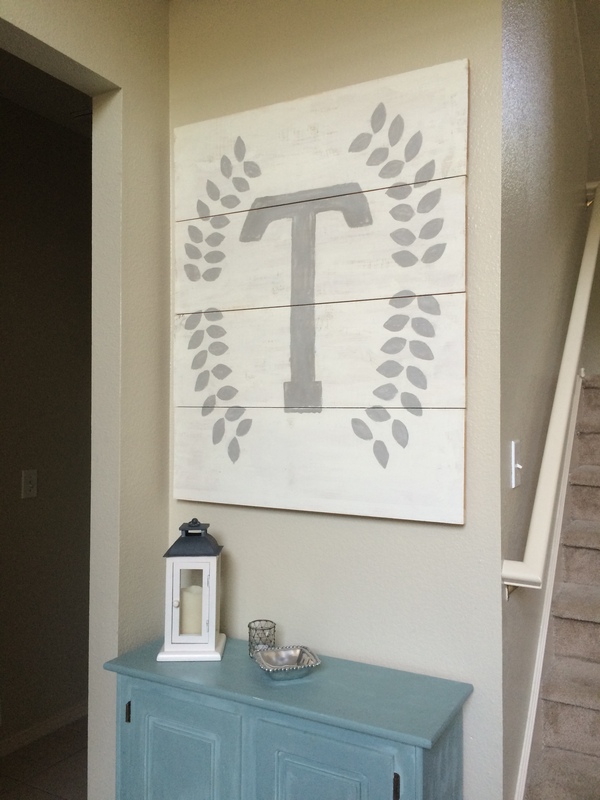 I painted the “T” and leaves in gray so that it would pull out gray in our family room and coordinate with the rest of our living space. This piece of wall art is so unique. I love that it is not just another piece of framed wall art. 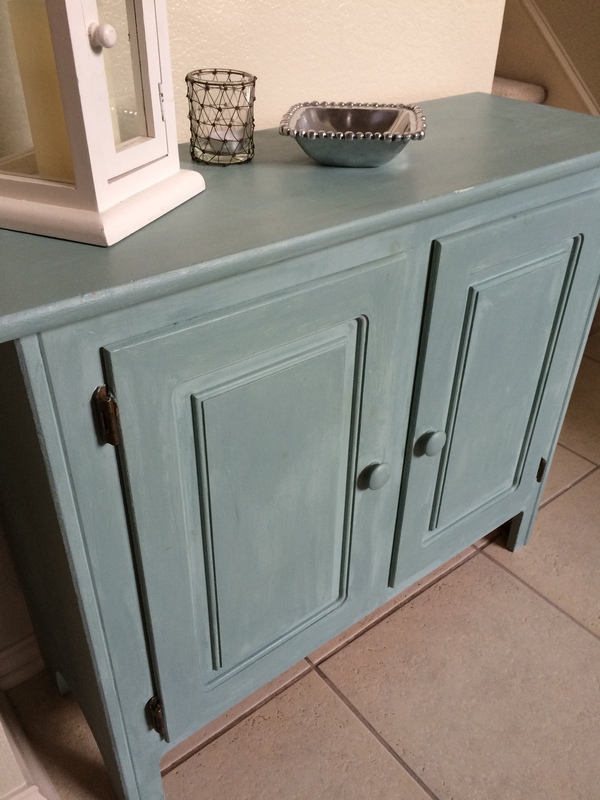 Décor Tip: When painting wood, if you ever get tired of the design, or color, you can repaint it over and over again to change with your changing styles. 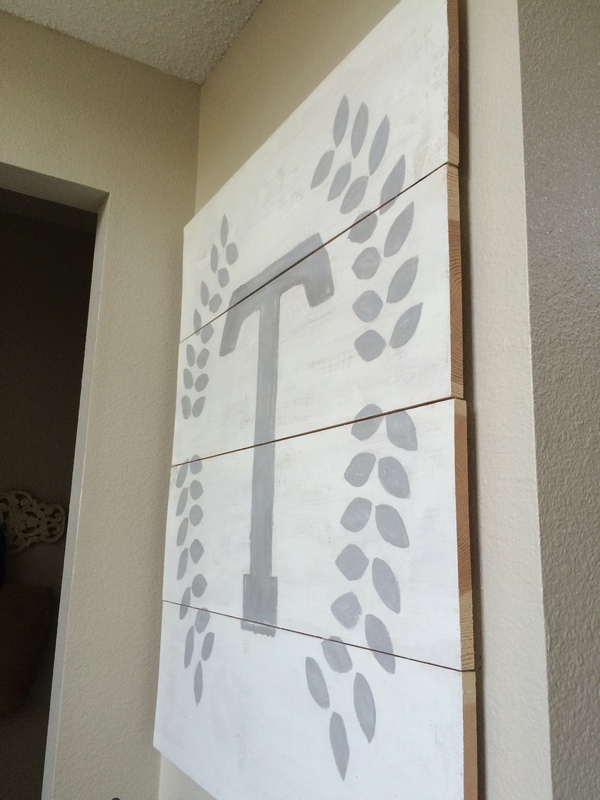 Finally, our empty wall was filled and our new piece of wall art fit the space to the “T”!